Asia Week New York got off to a festive start with a cocktail reception hosted by Aman, the Presenting Sponsor of Asia Week New York, at the stunning Upper East side residence of interior designer Sandra Nunnerley. 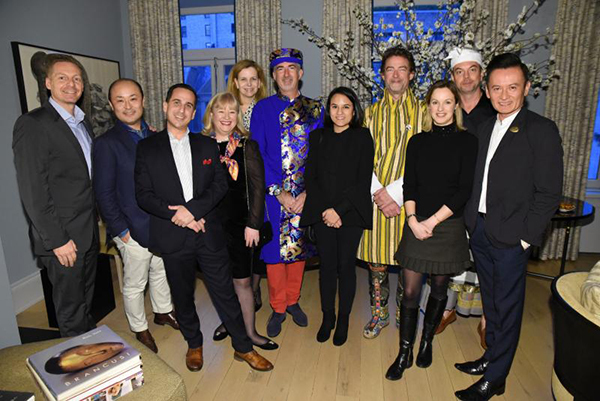 Dressed in their very colorful native garb, Aman general managers mingled with a crowd of collectors, interior designers, journalists, and their loyal Amanjunkies. The highlight of the evening was the surprise raffle that took place and three lucky winners were selected to discover one of the properties. Among the attendees were Ian White, Aman Indonesia; Tapa Tibble, Aman Sveti Stefan, John Reed, Amankora, Sven Van Den Broeck, Amanzoe, Yasuo Mizobuchi, Aman Japan, Donald Wong, Amantaka & Amansara,Serge Ditesheim, Amanyara, Nicolas Pillet, Amanoi. Also in the crowd were Geoffrey Bradfield, Ronald Bricke, James Andrews, Craig Manson, one of the winners of the raffle, Lark Mason, Alex Papachristidis, Philip Thomas, Edith Dicconson, Ritam Bhalla, Christina Prescott-Walker, and Christina Deeny, Marguita Kracht, and Jane Mackie who are part of the Aman marketing team. Learn more about Aman here.